As rapid as technology moves, there's no where to go but up. The internet continuously revolutionizes itself, and soon see that next two decades may be even more rapid in terms of pace than the past two. In our final installment of the Brandify 20 Year Anniversary series, we dive into the possibilities that the future holds for customers and brands alike. The internet has not always been the beautiful and diverse informational resource to 3B+ users that we know it as today. In fact, by 1997, the internet was barely beginning to pick up in making interactivity a sticky factor for the early adoptors of its capabilities. One of the most full-circle updates of 2017, AOL launched AIM in 1997. This year, AOL phased out AIM after two full decades, which shows that messging has evolved so rapidly that new demands must be met for today's mobile and social internet users. Moving into the early and mid 2000's, the internet rapidly began to pick up as some of its most prominent social channels began to take form. From Linkedin and Yelp, to Facebook, YouTube and Twitter, these online destinations became even more of a hub for conversation when the first generation of iPhone was released in 2007. FUN FACT: In 2017, it's safe to say that the internet has completely shifted the way humans learn and interact. 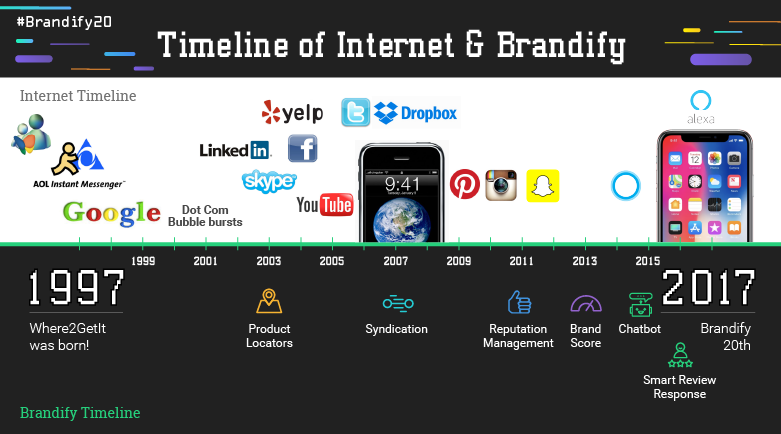 Over the course of 20 years, Brandify has integrated essential technologies to meet the shifting tides of the internet. From early product locators, to syndication, reputation management, BrandScore, Smart Review Response and chatbots, today's internet landscape is a world full of opportunities for Brandify's enterprise partners. 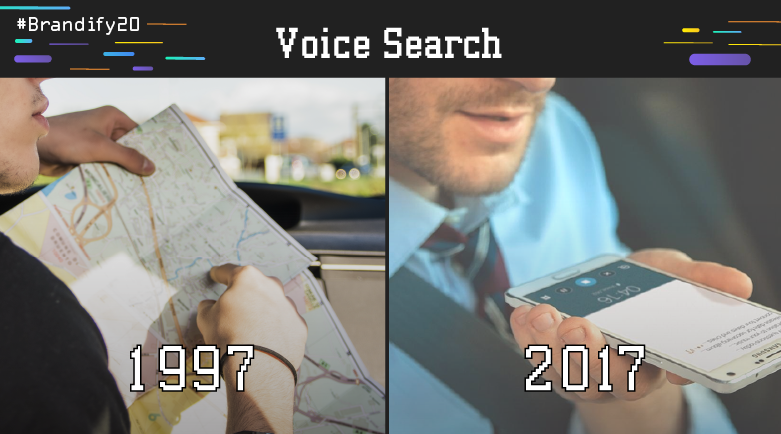 As mentioned in previous Brandify 20th Anniversary blogs, voice search is the new local search. The reason for this is simple: before, self-routing on the go really meant a driver would need a map-friendly copilot verbally guiding them through directions. If this wasn't possible, it was up to an individual to stop the car and plot out their journey. Today, the location data is richer and the only voice that guides users is that of their navigation apps and devices. This year, Google announced 1 billion users across its main branded tools for the public, one of which is Google Maps. Soon, with an estimated 50 percent of all consumers are expected to use AI and voice-activated technology in their daily lives by 2025, the shift will be complete and brands will be optimizing for this interface first and foremost. FUN FACT: One of Brandify Labs' earliest and most innovative on-going projects has been related to conversational search and commerce. With Cognify, location data and user interactions are enhanced with a layer of smart data and personalized information to satisfy a voice searcher's every concern. Since location data has remained core to brick and mortar presence since the early days of local marketing, it's no wonder that the integration and optimization of locator devices have remained one of the most essential techniques for brands to date. In fact, maps technologies like Google My Business is just now catching up in terms of integrating some of the diverse functionalities that modern locators can offer, such as messaging, peak times, photos, bookings and more. 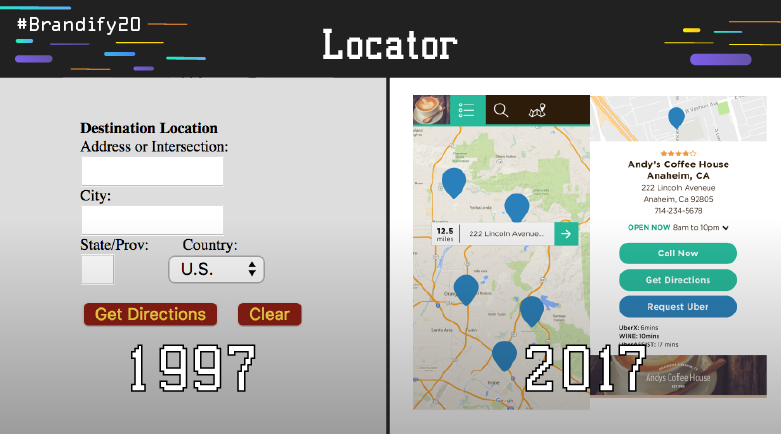 FUN FACT: Brandify began working on locators since the company began in 1997. The importance of this technology never waivered and now, we are working on making the data of these interfaces more useful and powerful to reach consumers across channels. Our Chatbot Locator is an enhanced version of a traditional locator, leveraging refreshed location data for intelligent interactions via Facebook Messenger. Before the turn of the millenium, one man with humble beginnings and big dreams dared to question the way that businesses interacted with customers online. Our founder and CEO Manish Patel created Where2GetIt, a local marketing company for national brands, which dedicated itself to serving some of the most long-standing national enterprises to this date. 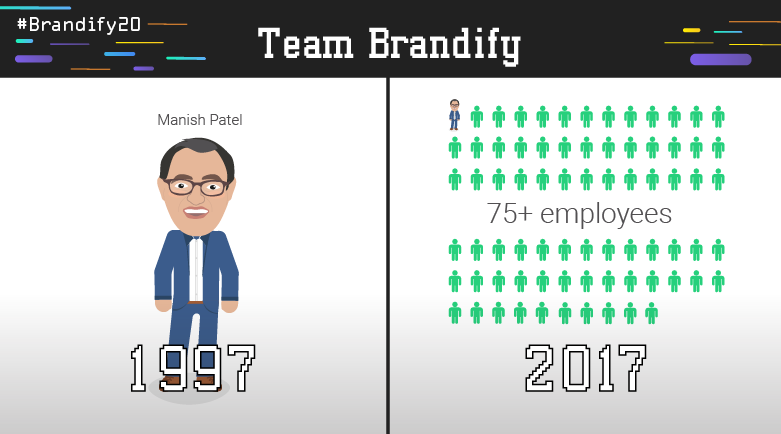 Fast forward 20 years - Brandify now has over 75 employees spanning across customer service, marketing, development, design and innovation. The team has developed a nationally recognized culture and has even made recognition across its diverse areas of expertise. FUN FACT: Every new Brandifyer participates in a "getting to know you" game during their first team lunch, where we ask the quirkiest questions possible and immerse them into our friendly family. Brandify is growing more than ever before and we are looking for forward-thinkers to join the revolution of location-based marketing. Check out career opportunities in product, marketing, development and design here! The holidays are certainly still about quality time with loved ones and friends. However, the newest layer to the mix that makes the holidays so magical is the accessibility of products like we've never seen it before, Whether it is through rapid delivery services like Amazon, in-store pick up at brick and mortar locations, or general e-commerce, the holidays aren't the same without a solid dose of shopping. 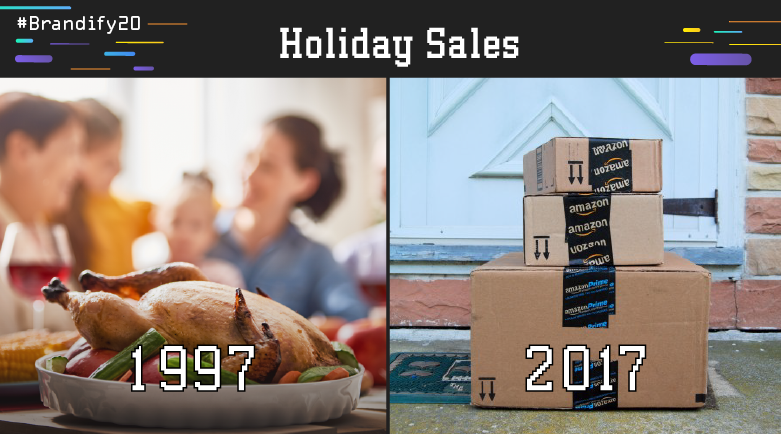 FUN FACT: With more holiday business comes more interaction from customers everywhere. ClickZ notes that 35% of customers will be less likely to make a purchase if they do not find reviews on a brand. With that being said, moderation and cultivation and reviews should be high priority for brands of all sizes this holiday season and beyond. Want to learn more about how you can use the past of Digital to rock your holiday season and 2018? Follow our latest blog series to begin implementing some of the most forward-thinking tactics into your new year strategy.